At each wedding, I always hope the time line will allow the couple a few minutes to step out during their reception for a few pictures. I love that this allows me to give my couple a variety of portraits from the day and allows them time together with just each other. For this image, I asked Hannah and Trey to step out of their reception once dinner was over. 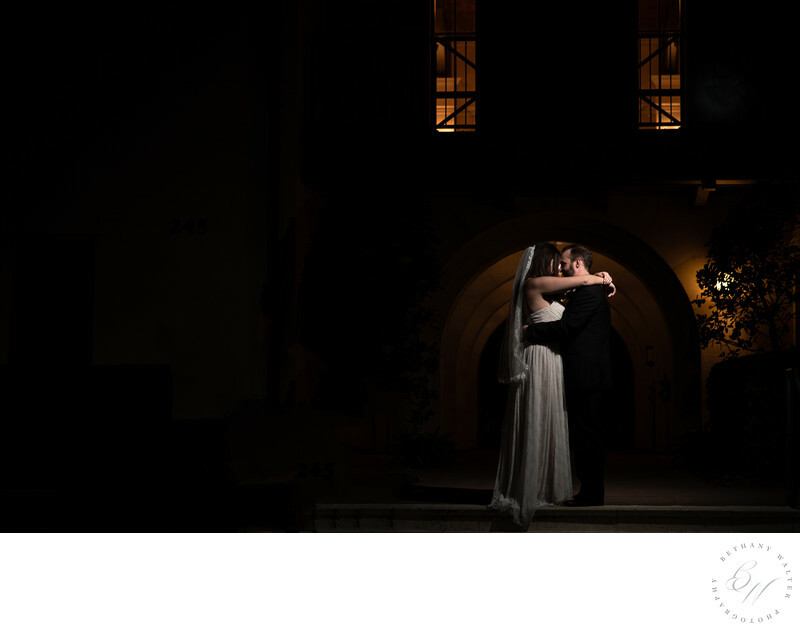 I loved the ambient light of Crosswater Hall behind them and I wanted to preserve that while highlighting them with off-camera lighting. To start with this image, I simply asked the couple to come in close to each other. The bride naturally wrapped her arms around the groom's neck and they brought their heads together. I love that this is a natural position for them and that it is preserved. To light this images, I had my assistant light them with a speed light and magnet mod modifiers to limit the amount of light hitting the couple. In post processing, I removed all evidence of the lighting equipment to create this final image. This is one of my favorite images from their wedding day. I love the light behind them and the moment they're captured in. Location: 245 Little River Road, Ponte Vedra Beach, Florida .